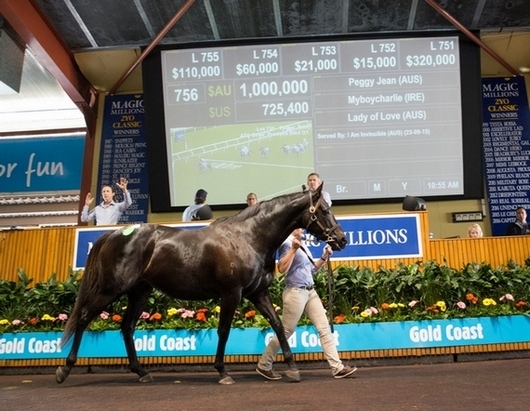 Early into the second session of the Magic Millions Broodmare Sale at the Gold Coast on Thursday the Group 1 winning mare Peggy Jean was sold for $1 million carrying a positive test to the in-demand sire I Am Invincible. The brown mare, by Myboycharlie out of the Lago Delight mare Lady Of Love, was sold through the draft of Yarraman Park Stud, who stand I Am Invincible, as agent for Triple Crown Syndications who bought and syndicated Peggy Jean as a yearling. Peggy Jean was trained by Gerald Ryan at Rosehill for a near perfect two-year-old season winning the Group 1 ATC Sires’ Produce Stakes over 1400m, running second in the Group 2 ATC Magic Night Stakes over 1200m, as well as winning a further race and placing twice. Her second dam, Twig Amour (Twig Moss) who won twice and was stakes placed is the half-sister to Lady Jakeo (Last Tycoon) who won the MRC Group 1 Blue Diamond Stakes. Her dam, Food For Love (Lunchtime), won the Magic Night Stakes and placed second in the STC Group 1 Golden Slipper. Further Group 1 black type in the family comes through a daughter of Lady Jakeo in Miss Jakeo, the dam of Mrs Onassis (General Nediym) who won the MRC Group 1 Oakleigh Plate. On Wednesday auctioneer Steve Davis called for an opening bid of $500,000 for Peggy Jean and the response was immediate. There was a pause round the ring while buyers assessed the situation as Davis called for further interest and then they finally showed their hands. The level escalated quickly in $50,000 bids from all corners of the ring. Widden Stud’s Antony Thompson, sitting with clients in the front of the rostrum, held the bid at $900,000. Davis took another bid from the side of the ring and the level was $950,000. There was another pause. Then Thompson raised his finger and indicated $1 million and that was enough for Davis to bring the hammer down. “There is everything to like about her. A lovely deep pedigree, a smashing physical type and for me a Group 1 winning two-year-old is everything you want,” said Thompson. “She is the sort of mare who could be a foundation mare, a real blue hen, and especially she is a lovely mare for Sebring and that is where she will be heading this year. “I think she is one we will keep for a long time,” he said. The Golden Slipper winner Sebring (More Than Ready) and Champion 2YO Colt of Australia in 2007/8 stands at Widden Stud. His sons Criterion and Dissident head for their own stud careers this season after stellar Group 1 winning race performances. A share in Sebring sold for $400,000 during the first session of the sale on Wednesday.